A new type of signature scheme is proposed. It consists of two phases. The first phase is performed off-line, before the message to be signed is even known. The second phase is performed on-line, once the message to be signed is known, and is supposed to be very fast. A method for constructing such on-line/off-line signature schemes is presented. The method uses one-time signature schemes, which are very fast, for the on-line signing. An ordinary signature scheme is used for the off-line stage. In a practical implementation of our scheme, we use a variant of Rabin's signature scheme (based on factoring) and DES. In the on-line phase all we use is a moderate amount of DES computation and a single modular multiplication. We stress that the costly modular exponentiation operation is performed off-line. This implementation is ideally suited for electronic wallets or smart cards. 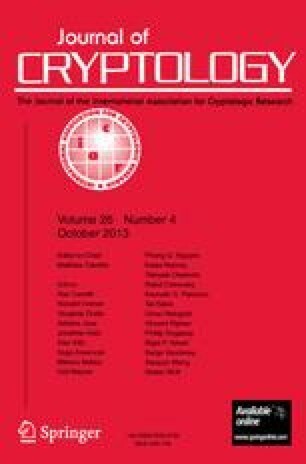 A preliminary version appeared in theProceedings of Crypto 89. Shimon Even was supported by the fund for the Promotion of Research at the Technion. 3.Laboratory for Computer ScienceMassachusetts Institute of TechnologyCambridgeU.S.A.